GM is looking to make a deal with Amazon that even Dr. Robert J. “R.J.” Scaringe, CEO of Rivian can’t refuse. The mad doc of the car lab is in with talks with Mary Barra of GM and Jeff Besos of Amazon to create a Holy Trinity Alliance that will create a super luxury bespoke electric vehicle brand that with extremely high end technology can be used to deliver packages to the nearest car trunk near you. Makes sense? General Motors and Amazon Corporation are looking to make a deal that will give them minority stake in the about to ramp up production startup Rivian Automotive. This deal could more than double Rivian’s valuation to $1-$2 billion USD. This stake and equity would give investors and waitlisters insurance beyond assurance that Rivian will be delivering pickup trucks by the fall of 2020. Rivian is coming into the full electric vehicle market as the second startup to make it successfully to production, the first being Tesla Corporation, making this an exclusive club and highly attractive to investors. Rivian is looking to become a boutique bespoke electric “adventure vehicle” maker that offers many different power train and battery power solutions to fit the particular needs of the customer. The luxury boutique business model immediately puts Rivian in a position to compete with vehicles like Range Rover with an eye towards easily upmarketing towards vehicles like Bentley Bentayga and Rolls Royce Cullinan. With GM’s luxury issues, this makes Rivian very attractive. GM could help Rivian to the Tesla finish line, assign Cadillac to Oldsmobile duty, and make Rivian the 1950’s Cadillac that Rolls Royce is now. Dr. Scaringe, the car lab mad doc I like to affectionately call him, has a car lab that’s CLASSIFIED. Shh. Jeff Besos wants to know what’s in there that can help him deliver packages. If Rivian Division of GM is the goal, I say to the mad doctor make sure you stay stand-alone, no GM ignition switches in Rivian vehicles, no sales volume for you ever Rivian, stay in your own factory forever like Bentley at Crewe to become a Rivian Museum, and GM: LEAVE THEM ALONE. Attention Planet Earth: Be prepared to witness the birthing of the new “American Standard for the World.” That’s Cadi- nooo, that’s RIVIAN!! [Changing tone to seriousness] I am closing my eyes, holding my breath, and waiting to exhale hoping for positive outcomes as I learned that Dr. R.J. Scaringe, Rivian Boy Wonder Chief is looking to sign a deal that basically is Cadillac insurance. With this possible deal between Scaringe and GM and Amazon, Rivian sets itself up to mostly likely one day become a GM brand, but not guaranteed. But I say most likely. This is the brand that eventually will sit on top of Cadillac, to make Caddy the OIdsmobile it really is now to fight Tesla. I say to the mad doc, please be careful, I hope you’re reading this. This is being done in so familiar GM fashion. When money is no object, when you have more money than any mint can print, you can swallow things up like a giant sperm whale that opens it mouth at a school of cuttle fish, you can buy or swallow anything you want. And whatever it is that GM buys, it assures that GM will be catapulted like Cruise Automation helped them to do with autonomy two years ago, to the front of the line of anything. GM would like to start grooming Rivian to become the Cadillac GM once had that they lost, and want it back badly, that GM never learns its lessons. We Americans really are greedy, car companies too, that’s unfortunately why it’s one of the reasons America is great! It’s just that we don’t do luxury car brands very well. We treat our own like crap to turn them into car sales volume whores for fleets like airport rental counters. You’re really doing harm to the Lincoln brand when you rent one to go to Disney World. I’m afraid this is what will happen to Rivian. This is also why the premier luxury brands in Europe 100 years ago are still alive today and doing relatively well. Rivian is going to have to find a way to make this different for them here in America, because they have to be a real global brand, something Cadillac really isn’t around the world, although they say they are. Rivian also needs to find a way for their survival to make sure you can’t rent one at MIA or LAX. It’s the sales volume thing that’s killing these brands, Mercedes and BMW too, as they too are becoming toast. This is just an investment that gives them controlling interest, not majority stake, neither a purchase. They didn’t buy Rivian yet, because in an industrial sense, Rivian although chartered and up and running for a decade, they are now finishing touching up on ramp up to premier production, and they aren’t producing yet. And although GM needs to see results, they can wait until they do. So let’s take a look at each: Rivian, GM, then Amazon to see what they get out of a possible deal. Just the mere fact that Rivian is in a newsfeed with GM and Amazon puts Rivian in the big leagues for the first time. They might be one of the most influential companies of 2019 moving forward, especially if this deal is signed. Even if it’s not, Ford should take a look because like GM and crappy Cadillac, they too need a super luxury brand that sits on top of Lincoln, and if they invest now in Rivian they might have that brand that will make Lincoln the new Mercury, if that makes sense. And they can do it on the cheap while Rivian is finishing their gestation with their first production ramp up. Ford has latched onto Volkswagen Group with their MEB platform to finally start making real electric cars, not these hybids people are getting so turned off about when trading in their Prii for Model 3’s. But VW Group has made it clear it has no intention of merging Ford into the group brand, for now. If they did they wouldn’t need Rivian, in fact Lincoln for that matter. They already are spending more on battery electric technology than anyone else, spending up to $60 billion USD. They have good technology of their own, and they have Bentley and Audi to make their high end trucks. With Rivian, which I think would be a more perfect fit, Ford would get both the brand and the mad doctor’s technology to continue making these electric vehicles on their own. So VW could help Ford make the transition which they really need to, as Ford was going to make the mistake of putting that awful hybrid crap into the Ford F-150 that would make Ford move from ruining Lincoln to ruining F Series. With VW stopping that, Rivian can eventually help Ford finish the job of full electric roll out and give them a luxury brand everyone else can oooo and ahhh about. What startup wouldn’t welcome these kinds of alliances. This is the kind of deal that keeps them going to get larger, have more options to build factories, add supply chains, grow retail networks, and assures initial investors they’re serious about what they’re doing. The first people who invested money are now even more likely to see in the coming months a new Rivian in their garage. In fact it’s almost guaranteed. I think GM is realizing with how they handled the “Cadillac is the lead brand” competition with Tesla roll out and the XT6 unveil that the rebooted new “American Standard for the World” has at least become old if not dying or just dead. People have really lost their patience with the Cadillac brand. Even Andrew Palmer, CEO of Aston Martin said that Cadillac as a brand is toast and that there are six pinnacle luxury car brands, and Cadillac which was at once the seventh will never return to that exclusive club. In the new electric age any key player is going to need a stable, profitable, viable, desirable high end luxury brand that sits at the very top. Cadillac was once a peer to Rolls Royce. Not anymore and ever. So Caddy is being poised for either semi or full retirement, probably something close to electric Oldsmobile duty demotion, which is isn’t a bad place for it to be, and instead something else can sit on top that’s hard to buy, very desirable, very exclusive, everyone wants, but few can get between expense and supply, and that could be a Rivian. This is the attraction GM has toward Rivian as it struggles to revamp, reset, and reboot their Cadillac luxury division, which realistically for the last ten years, has failed. In order to be cutting edge in technology, advertise state of the art, and to make a ton of more money per unit with trucks than with mainstream brands, car makers, particularly electric ones, need a high end brand the likes of Bentley and Maybach to promote the group brand. GM input would give Rivian experience, lessons learned, capital investment, and training to burnish a luxury brand to possibly become the American Rolls Royce that Cadillac once was before, that GM from the 1970’s on turned Cadillac into a luxury prostitute in sales volume profiteering. GM is realizing that with recent missteps that Cadillac isn’t going to cut it as a premier luxury brand anymore, they really destroyed it. This might be the better option as opposed to resurrecting an extinct luxury brand like LeSalle, Duesenberg, or Packard for example, to instead start here with a brand like Rivian and start all over again, Cadillac lessons learned. Rivian just needs to be careful with anything GM and its dysfunction. With GM absorption they risk being infected with the GM poison. This is still the same poison that today still infects GM with cheap plasticky interiors even in Cadillacs, buying companies like Saab to cruelly sell them off and die, front wheel drive for performance luxury cars, and one assembly line for all brands but different grills and tail lights, creating new brands they don’t need like Hummer and Saturn. For the decades of the Harley Earl and Bill Mitchell Eras, GM was skillful in both the design studio and at the GM accounting offices of keeping each brand separately and in some cases although there were alliances like between Cadillac and Oldsmobile in sharing power plants and technology, they often competed against each other in a healthy way. As the 1970’s came with the bean counters taking the foreground and designers and engineers taking a background, the GM infection began and to this day, even past bankruptcy that was the reason for all that, GM still can’t shake that infection from car cancellations to premature vehicle even car company electric conversion announcements while stuffing new gas cars back into their portfolio! One hundred years ago after World War I Rolls Royce Motors grew into two arms, one made high tech luxury cars and the other the power plants that powered them and anything else that moves or has power by man on earth. Under the group, one was a high end luxury car brand, the other, one of the most influential and powerful aerospace companies in the world that provides weapons to the US and its allies, and power plants to things like nuclear reactors to the fastest aircraft in the world. They are now completely separate companies. One is Rolls Royce Motor Cars, the other, Rolls Royce Limited, PLC. PLC just leases the flying dragon fly on the hood to the car company. This is where Jeff Besos comes in. What we are seeing here at Rivian is an extremely smart man, that’s the doc, who has honed the battery electric technology so that it becomes even more powerful, more efficient, and lasts longer. Rivian is so high tech, that history has shown that these kinds of car companies have the potential of branching out into two arms, one about the vehicles they started with, the other about the power plants that push them. Amazon is interested in what pushes a Rivian. Rivian is about to become a Rolls Royce in more ways than one, and Amazon wants to be there when that happens. Should there come a time when Rivian Adventure Motor Cars Ltd. and Rivian Aerospacemarine Limited PLC go their separate ways, that would be a fortune grabbing investment off the stock market for Amazon and Besos. Start investing now. All this, and Amazon can find ways to deliver packages faster with green technology from the doc’s lab into your car trunks (excuse me, hatches, we’re in a CUV world now, whatever that is. Will Rivian ever make a saloon for me?). Get it folks? I’m really rooting for this kid the boy wonder, 36 year old mad Dr. Scaringe than I did for Elon, and I kinda like Elon though I never met him. I can’t wait to meet the mad doc one day. He kinda reminds me of W.O. Bentley in some ways, the wonderkid of Cricklewood, the 21 year old wet behind the ears who greeted you at the factory door! Bentley like Elon has his share of mistakes, but both Bentley and the doc were/are running a luxury car company exactly 100 years apart, one celebrating its 100 anniversary last month, this one about to start production next year. Bentley immersed in gas engines, Scaringe with electrics. If Bentley can provide the Queen with a state car I’m certainly hoping the doc will make one for the president one day too. Dr. Scaringe has something very special here with his lab and his company. There is a potential of Rivian becoming an industrial powerhouse that GM already is, and Tesla is on the way of becoming. And suddenly it’s all about his brand. And he knows it. He can keep a secret too. He knows when to keep his mouth shut and when to open it. That might be his greatest gift he gives his company, that’s Elon’s biggest self destructive weapon with his. When it comes to burnishing a brand, all I ask of the doctor is this: your brand is special. Even if you one day give it to GM make sure that the Rivian factory becomes a working museum where the cars will still be made even 100 years from now, and there’s nothing there about Chevys or Buicks. No sales volumes please! After you’re gone that your CEO factory parking spot becomes your statue pedestal and memorial, that when one gets into a 2120 Rivian for them to celebrate 100 years from now the first production year, there is nothing in that luxury truck cabin that remotely suggests that it’s a GM. Because, after all, it’s a Rivian. And they’re still hard to find, hard to buy, everyone wants, but few can get, and Rivian makes a lot of money doing that. That’s the way it should be. Run with it doc! 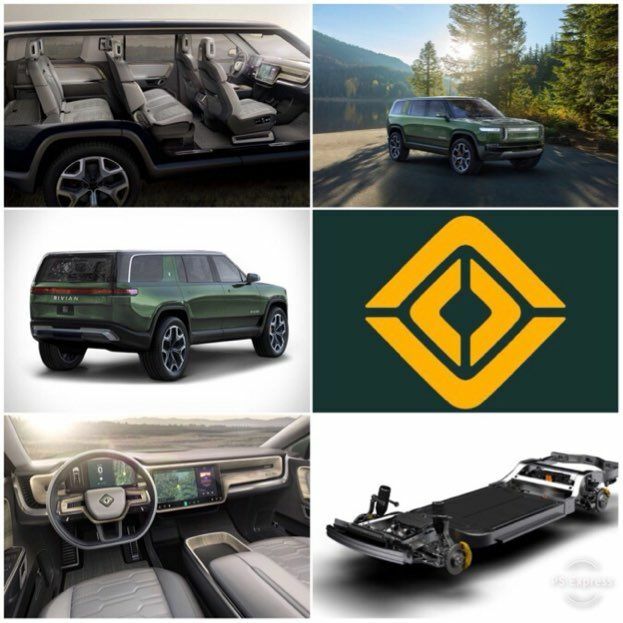 Photos are from the Rivian Media Website. Images are published here and all under Section 107 of the Copyright Act 1976, allowance is made for "fair use" for purposes such as criticism, comment, and news reporting. UPDATED NOTICE: I am so grateful that my publisher allows me the generous privilege within reason to express my opinions about matters related to the auto industry. I try to be judicious and respectful about the content. I ask you do the same in the comments section by refraining from inappropriate language and content. Please be nice, there’s no reason to get nasty, this is only about cars. The irony is if you came up on me on the street to recognize me I’d grab a beer with you and we’d talk about cars for me to thank you for being a reader! I may disagree but I truly do love you all, I’d take a bullet for many of you. And please keep in mind that the opinions expressed here are solely mine, and not those of Hareyan Publishing or its employees, including my staff colleagues. What do you think of the Rivian buy-in talks? Please let us know below!